Art as Social Practice  A critical investigation of works by Kenneth A. Balfelt looks at a number of vigorously debated collaborative projects undertaken over the past twelve years in and outside Denmark by artist Kenneth A. Balfelt. It contains both introductions to five projects, interviews with the people involved in the projects and finally four essays trying to reflect on the impact of these kinds of artworks. As in many other social art practices Balfelt frequently works with a highly-defined and often marginalised group. We will therefore meet people involved directly or indirectly in the projects  also those who are not normally heard in the field of art criticism or not normally encountered by the public  in our effort to vitalize and qualify the critical language on social practices as a part of the contemporary art field. 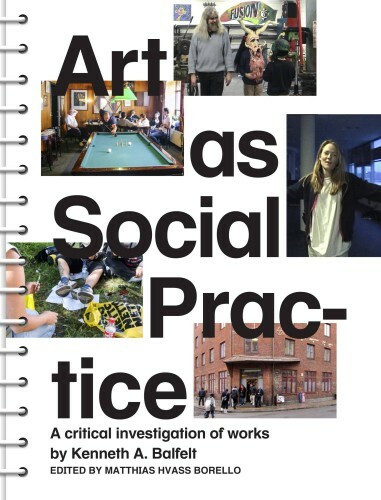 Art as Social Practice is a publication on contemporary art practices concerned and engaged in social issues and life with theoretical contributions by Barbara Steiner (DE), Brett Bloom (US), Matthias Hvass Borello (DK) and Daniel Tucker (US).